The Wolf Keep Wildlife Sanctuary is a nonprofit facility located in Montana near the famous Blackfoot River (of 'A River Runs Through It' fame). 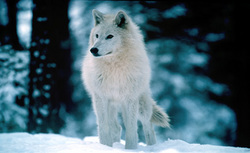 Beginning in 1996 with Carl Bock's purchase of twelve wooded acres, it has evolved into a scenic and secure home for a pack of gray and arctic wolves. The enclosures cover ten acres. The main enclosure where the pack spends most of their time is a large, forested six-acre hillside. A number of other enclosures for various purposes are adjacent to the main house and main enclosure. .So many people expressed interest in visiting the Keep that we opened to the public in 2002. Visitors will view the pack, learn about their fascinating social structure and unique individual characteristics, and come away with a better understanding and appreciation for the wolf's special place in our environment. Directions: To visit the Wolf Keep Wildlife Sanctuary, follow Interstate 90 east past Missoula, for 6 miles or west past Clinton 11 miles, to Exit 109 Bonner. Exit and follow Highway 200 through Bonner and continue on Highway 200 following the Blackfoot River for 11 miles. Just after crossing the second bridge over the Blackfoot River, look for the sign to the Wolf Keep. It is almost directly across the highway from the entrance to the Blackfoot-Clearwater Wilderness Corridor and Johnsrud Park. Turn right at sign and cross the small, historic MacNamara's Landing Bridge. Follow the road uphill and follow the signs to the right. We are at the top of the hill and can be seen from the highway.